I am sure by now you know that I love quick and easy recipes. This cookie recipe is about as quick and easy as it gets, but just because it is quick and easy, does not mean it is not good. These cookies taste great. These cookies contain ingredients that I almost always have on hand. They are a no bake cookie, so they would work well all year long. Plus they are chocolate, and who does not love chocolate. These were inspired by a recipe I saw in a Martha Stewart Everyday Food Magazine. 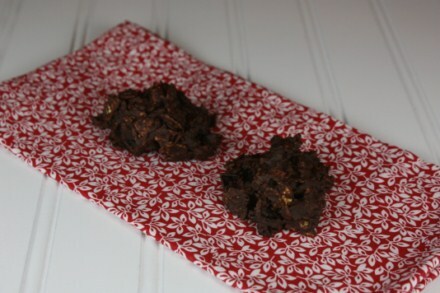 I say inspired because I used a different kind of chocolate and a difference dried fruit. Martha’s recipe called for dark chocolate, and although I love dark chocolate it is not something that I usually keep on hand. Her recipe also called for dried cherries. Again I love dried cherries, but my kids eat these a little to fast to justify the cost of dried cherries. Craisins worked just as well, and I almost always have those on hand. I also used more dried fruit than Martha’s recipe did, because when I am covering fruit in chocolate, why not sneak some more in to make it healthier. So, I guess this is my adaption of Martha’s recipe. Sorry I just can’t leave a recipe alone. Now on to the pictures. Some foods just do not photograph well. These cookies are one of them. I tried three different times to get good pictures and I was not happy with any of them. However, we did end up with a lot of really good cookies to eat, while I was trying to get good photos. I thought about not posting the recipe because I could not get good pictures, but my family loves these so much that I decided to post it, without a really good picture. These may not be pretty cookies, but they are so good! Place cornflakes in a large bowl and crush slightly. Stir in craisins and set aside. 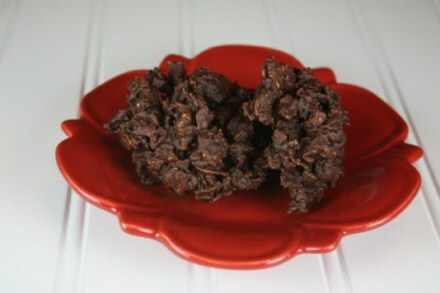 Melt the chocolate and stir into the cornflake craisin mixture. Drop onto cookie sheets and place in refrigerator until firm. Once firm remove from cookie sheets and enjoy. These have the best texture when kept refrigerated until ready to serve. I love craisins and chocolate together! When I make fudge, I add craisins. That’s how my mom likes it best! I’ll be trying this recipe soon! Thanks for posting! Could you use raisins instead? Would that taste good? @Martha Artyomenko, I think raisins would work fine. We like the contrast of flavors with the craisin being a little tarter, but yes raisins would be fine. Tried them– YUMMY! And EASY! My kind of dessert! Thanks for sharing. 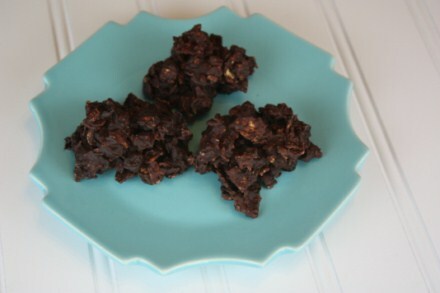 I just made these with a bag Nestle’s new dark chocolate chips and cherry craisins. Yum!